1. That the Hebrew-Judaeo-Christian Canonical Holy Scriptures, the Bible, is the special, totally adequate written Word (Revelation/Message/Communication) of God; all of the Bible is given by God the Father but it is authored by and it is the testimony of (from, on, in, through, with, to and for) God the Son, the Lord Jesus Christ, and it is written by the servants of Jesus when He inspired them by God the Holy Spirit. 2. That in one Godhood (kind/class/order/category/essence of being God) there are three (3) Members-Persons in the infinitely perfect kinship relationship of the Father and of the Son and of the Holy Spirit all of whom constitutes the Biblically real TRINITY or the TRIUNE GOD (three Persons, Relative Position Designations and Functions each member of the TRINITY is individually, eternally and absolutely distinct from, unique among and not interchangeable with, any one or more of the other two remaining Members-Persons of this TRINITY. 3. That, in keeping with the TRINITARIAN ALL FOR JESUS COMMITMENT, ETERNAL COVENANT and CONSTITUTION OF BIBLICAL REALITY, The entire self-determination/ disposition/ commitment, purpose and pleasure of God the Father is to give all of His all and all of God the Holy Spirit and all of all creation to Christ Jesus, the Almighty Lord God the Son, and, the entire Person, Purpose and Functions/Works/Ministries of God the holy Spirit is to give all of all uni-directionally from, on, in, through, with, to, and for the said Almighty Lord God the Son – the Christ (the Anointed of God the Father and by god the Holy Spirit), and the entire self-determination, works and services of Christ Jesus, the Almighty Lord God the Son in giving pleasure to God the Father and to satisfy God the Holy Spirit and to render justice to everyone in all of reality, is simply to function always as ALL in all even in His incarnation and Perfect Manhood. 4. That in all the works of the TRINITY, God the Father is mainly a CO-PURPOSER/CO-GRANTOR/CO-GIVER and CO-APPROPRIATOR of all things, and , God the Son ALONE is the principal, main and actual direct, exclusive and permanent DOER-FULFILLER-KEEPER of all things, and, God the Holy Spirit is the confirmer-witness-bond of all things. 5. That vis a vis all of creation, God the Father is the directly invisible, inaudible, inaccessible/unapproachable and unknowable God, and God the Son, Christ Jesus Himself is the DIRECTLY SELF-REVEALING, SELF-IDENTIFYING and SELF-HUMBLING LORD (YAHWEH, Adon, Kyrios) God (Elohim) who being the LORD (YAHWEH, Adon, Kyrios) God (EL) Almighty (SHADDAI) is graciously, truthfully and righteously always functioning as ALL in all, giving due course to everyone in all of reality and justly satisfying all of all, and, God the Holy Spirit is the Symbolically Self-Manifesting God whose entire Person, works and ministries only proceed unidirectionally from, on, in, through, with to and for the Almighty Lord God the Son, Jesus Christ. 9. That everyone whose entire life is voluntarily and consistently unidirectionaly from, on, in, through, with, to and for Christ Jesus, the Almighty Lord God the Son and all in all is truly owned, occupied-possessed and ruled by Jesus and as susch he/she is His spiritual child, whose SALVATION, ETERNAL LIFE, EVERLASTING GLORY and ALL in all is Christ Jesus Himself; but everyone whose entire life is not voluntarily neither consistenly nor unidirectionally from, on, in, through, with, to and for Jesus is a satan/an antiChrist/a child of the devil, accursed by the TRINITY and will be cast into the lake of fire. 10. That after the last judgment where all of those who have not directly neither exclusively nor permanently nor irrevocably addressed, submitted, committed, subjected, focused, conformed and devoted all of their all to Christ Jesus Himself will be cast into the lake of fire: but on the other hand all of those who, in obedience to God the Father and in cooperation with God the Holy Spirit and in rendering justice to God the Son, have TRULY GIVEN ALL OF THEIR ALL to Jesus by having voluntarily, directly, exclusively, permanently and irrevocably addressed, submitted, committed, subjected, focused, conformed and devoted all of their all unidirectionally from, on, in, through, with, to and for Him alone, then, He will take them to the New Heavens and the New Earth which He has made for them, where they will be with Him to behold His ever glorious face and to serve Him forever. 12. That with our entire capabilities, opportunities and responsibilities throughout the world and unto eternity we are informing and/or transforming, and/or conforming all of everyone and all of all, in all of creation, only in accordance with, as per requirements of and in adherence to the Biblical ALL THE TRUTH of (from, on, in, through, with, to and for) Christ Jesus, the Almighty Lord God the Son Incarnate and Perfect Man. 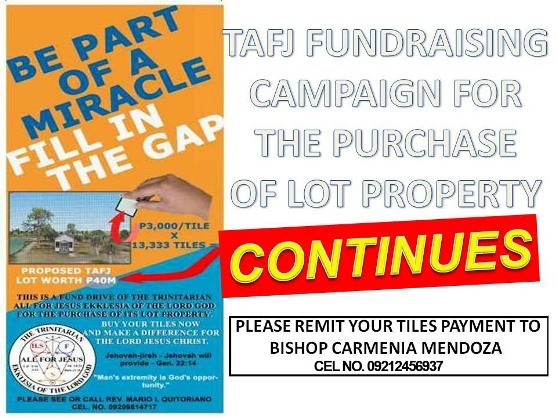 TAFJ Statements Of Faith by Rev. Edilberto C. Medina is licensed under a Creative Commons Attribution-NoDerivatives 4.0 International License.